Rembrandt is revered not only as a painter, but also as a supreme master of etchings. His work in etching spanned most of his career and embraced the wide range of subjects he pursued in his painting: portraits, landscapes, biblical scenes, pictures with allegorical and mythological themes, and more. We know almost nothing about the distribution of Rembrandt’s etchings. It seems possible that Rembrandt printed them in his own studio; he may even have been responsible for their distribution. The high standard of the impressions and the frequent reworking of the plates support such an assumption. It seems probable that the majority of Rembrandt’s plates were still in his studio during the last years, even though they are not listed in the inventory of 1656. Nevertheless, one cannot exclude the possibility that outside publishers were requited. An etched plate can only produce a certain number of high-quality impressions because the process of printing wears down the etched lines, making them more indistinct with every impression. Approximately one hundred excellent impressions could have been obtained from one of Rembrandt’s plates. However, this number sank drastically if drypoint was used because the burr is much more fragile. From such plates Rembrandt may have acquired 15 to 20 excellent impressions, a number which is consistent with existing examples. The velvet tonality so characteristic of the technique diminishes with impression made over and above this number. Intaglio – The collective term for several graphic processes in which prints are made from ink trapped in the grooves in an incised metal plate. Etchings and engravings are the most typical examples. Engraving – A method of cutting or incising a design into a material, usually metal, with a sharp tool called a graver. 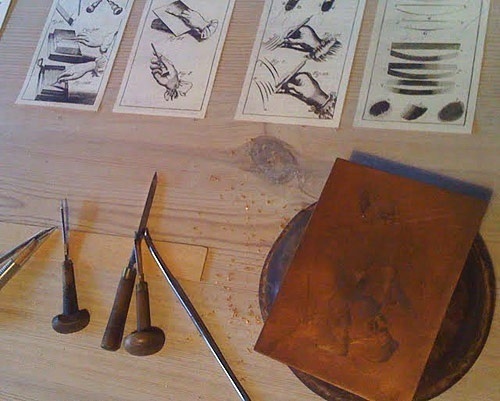 One of the intaglio methods of making prints, in engraving, a print can be made by inking such an incised (engraved) surface. It may also refer to a print produced in this way. Most contemporary engraving is done in the production of currency, certificates, etc. Etching – An intaglio printing process in which an etching needle is used to draw into a wax ground applied over a metal plate. The plate is then submerged in a series of acid baths, each biting into the metal surface only where unprotected by the ground. The ground is removed, ink is forced into the etched depressions, the unetched surfaces wiped, and an impression is printed. Also, both the design etched on a plate and an impression made from an etched plate. Too often confused with engraving.